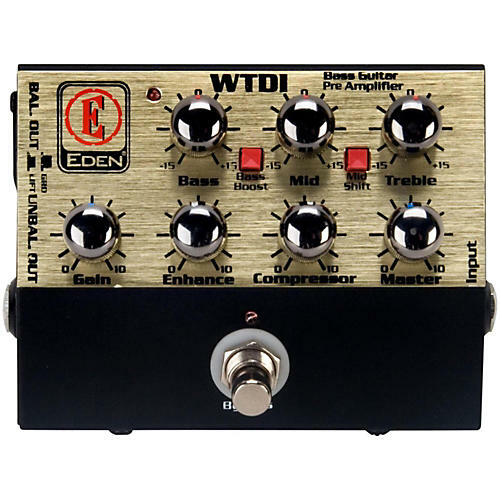 The WTDI World Tour Direct Box/Bass Preamp from Eden is something fans have been requesting for a while, and now Eden delivers! Much more than a direct box, the WTDI is like bringing a little Eden preamp to every stage and studio gig! Keep one handy in your gig bag, case, or on your pedal board and use it to Eden-ize that junk box of an amp they gave you for backline at the gig by going direct into the power amp section. Or use it to add a 2nd, 3rd, or solo/boost channel to your current rig. The WTDI also works extremely well with acoustic guitars/basses. The rugged WTDI Direct Box/Bass Preamp is true bypass with both 1/4" and XLR (with ground lift) outputs. Besides 3 bands of tone control with bass boost and mid-shift functions, volume, and gain controls, Eden added variable compression and their legendary Enhance control. All this comes in a compact box complete with universal power supply. Also runs on most 12-18 volt-capable pedal boards and power bricks. The Eden Warranty on the David Line Products remains in effect for two years from the date of first consumer purchase. Your Eden Warranty protects the original purchaser as long as your Eden product has been purchased in the United States. If your product has been purchased outside the United States, please contact your local Eden distributor for warranty information. The original dated bill of sale must be presented whenever warranty service is required. -damage to any Eden product on which the serial number has been defaced, modified or removed. In the event that warranty repairs are necessary, Eden Electronics will pay for all labor and materials on all factory authorized repairs covered by this warranty. Eden Electronics will have no obligation to pay for repairs not authorized as warranty by Eden Electronics. Save the original shipping carton. Upon authorization, return the equipment in the original carton to Eden. Replacement cartons may be available upon request for an additional charge. Improper packaging may cause damage resulting in denial of this warranty. If repairs are covered by warranty, Eden will pay to ship the equipment back to you. You are responsible for shipping charges to the factory. If your equipment needs repairs, first contact your local Eden dealer or Eden Electronics, Inc. 444 E. Courtland St., Mundelein, IL 60060 or call (800)877-6863 or (847)949-0444. You will need to present a copy of the original dated bill of sale. Please do not ship your equipment to the factory without prior authorization. You are responsible for properly transporting your product to the factory. The above warranty is in lieu of any and all other warranties, expressed or implied, including but not limited to warranties of merchantability and fitness for particular purpose. Neither the dealer nor the manufacturer shall be liable for any incidental or consequential damages resulting from any alleged defect and the warranty shall extend exclusively to repair or replacement of the equipment described. This limited warranty gives you specific legal rights, you may also have other legal rights which vary from state to state.